Remembering Rockabilly Legend (& My "Uncle") Malcolm Yelvington - JP loves LIFE! It was great fun to hear a grown up singing about how “grandpa Jones was a good ol’ man but there’s one thing that he can’t stand, he’d grab that cane and start to pack whe grandma started that yakety yak, he’d say ‘I’ll be walking, while you’re talking,’ said ‘I’ll be walk, walk, walkin along.” We’d laugh and smile like crazy. He’d also sing a song that would raise eyebrows as it talked about just how bad someone needed a cigarette and how smoking them would puff yourself to death. And I can remember coming up with berries so we could add them in when he would sing about “wine spodee odee” and we’d all join in. Or any of the other songs he’d come up with cause we loved them all. It wasn’t until I was in high school or college that I found out that my Uncle Mac (aka Malcolm Yelvington) had recorded those “made up” songs (they were rockabilly) for Sun Records. I’ve always loved music, but in college with a professor who was part of music history — Bill Randle — I got into it. And I remember spending time with Uncle Mac and his wife Louella figuring out things, getting him to play some for me and walking down the two memory lanes — his in the music business before raising a family and mine of being a kid entranced by a friend of the family who sang with a big smile. Discovering his connection to Sun sure made my visits home take a different spin. On several occasions, I found a way to get time with Uncle Mac and his guitar! He loved it as much as I did (and maybe more!) I had the chance to visit he & LouElla at their home and got to see him play music in a variety of venues. I got see him play live at street parties in front of Sun, at bars on Beale Street (though Mac & LouElla never had anything stronger than a Coca-Cola, in festivals downtown and probably other places too! And I had more chances to just chat with him about things. After putting music on hold til he retired in his 60s, Malcolm heard from a promoter in Europe. That’s around the same time I got interested in popular music history. But let me tell you about Mac’s piece of history…. Mac grew up a country boy near the small town of Covington outside of Memphis (for those of you who read the blog regularly you’ll enjoy knowing that the Ripley Cotton Pickers was another band in the area). He’d tell me about how that made him a lot more hillbilly than the rockers he recorded alongside. The other names are the names that are spoken in households and on radio stations — Elvis Presley, Jerry Lee Lewis, Roy Orbison and one of the countrier folks that recorded at Sun, Johnny Cash. Lots of people (probably including me) wondered what it was like to be recording music and see that your track was just after some young kid named Elvis and then see Presley and others become famous while Mac focused on his job as a pipefitter. But Mac just sort of shrugged it off talking about those guys were younger and didn’t have families so they had different choices. He found church in that timeframe and joined the church my family grew up in. 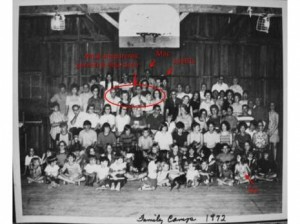 He had a big family with five kids and lots of grandkids, and great grandkids. I was lucky enough to be there to hear the stories and see the scenes. One of my all-time favorites (and I wish I had photos to prove the story!) was a time Mac played on Beale during Elvis Week. We went in the club and sat down. There was a Turkish Elvis impersonator (no, I’m not making that up) who was singing a couple of songs. He finished and began pacing around — staring at Mac. Mac got up and played (probably with Gary Hardy and James Lott who were part of a lot of the Memphis gigs Mac played). The guy circled us for quite a while getting closer and closer. He was star-struck. I had seen him taking photos earlier so I asked if he wanted a photo with Mac. WOW! Was he excited! And Mac was grinnin’ from ear to ear. When he sat back down, he told me how many times that same thing had happened in Holland and the UK. How college-age kids knew more about his music than he did. There were several more times he was in the limelight. 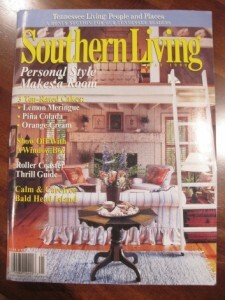 One that I pulled out today is a 1999 issue of Southern Living that featured a one page article on him. (All this came to mind after my cousin checked to made sure I had Mac’s CD “There’s a Little Life Left in This Old Boy Yet” on my iPod — by the way, why isn’t it among the options for Malcolm Yelvington on iTunes?) And I have another magazine that came from Europe that had an article or two on Uncle Mac. He brought me a couple from one of his tours. That’s safely tucked away but since I moved recently, I can’t be sure where the new safe place is LOL! Another story that totally makes me smile…. Malcolm would love this story too. He loved music and his church both and found various ways to combine them, including playing with a group of musicians and recording songs there too. While I’m getting off track, I have to mention that I had the chance to go down to Sun & snap photos of Mac while they were recording. 😛 But knowing how Mac loved the rockabilly sound & the rise of his music late in life and his church, I think he had to be smiling when The Dempseys showed up in their 1950s clothes and great fifty-fied hair! The Dempseys were a rockabilly band that played Memphis a lot and entertained Mac greatly when they played together, especially when the bass player would stand on his bass and play! Just watch!!! Mac had to be smiling at that! If you didn’t know Mac, I hope you had someone like him in your life. Someone who loved his life and enthusiastically tried new things in his seventies when others were thinking they’d slow down, Mac took his first flight AND IT WAS TO DO CONCERTS IN EUROPE! If you love Malcolm Yelvington as much as my family (or if you are family), you should check out this video that was done for a film student’s school project. Its kind of fun to hear Mac & see clips from back in the day. It is 10 minutes long though so sit down and relax. And if you’d like to share a story about Mac, feel free! Feel free! I just checked out your site and bet some of your folks would enjoy reading it. Had you ever heard of him before? Actually I had not, I’m still pretty new to the scene. But i am sure glad I did and I loved how you described him. I’ll post it to my blog too, if that’s cool. I haven’t been able to read it yet, but I’m looking forward to reading it tonight! I’ve definitely heard of him and I love reading this kind of stuff and sharing it with my blog readers! Wonderful story! I dig your uncle’s music. Thanks for sharing! I just woke up. I can’t sleep so I checked facebook. I’m glad I did! Cousin, your story made me smile and brought back so many great memories. I used to stay with Phil Yelvington and his family 2 weeks during every Summer while my folks were counselors at Bethany Hills. What a treat to hear his music sometimes at his home, but mostly I remember him playing at camp. I miss his humor. I miss his teasing. He had a grip like a vice whenever I gave him a handshake. He was a man’s man. I don’t ever remember him losing his temper and his boys have the same sense of humor that he did. It was nice of you to write the blog entry honoring him. As you stated in your blog (and I’m paraphrasing), everybody should be so lucky as to meet and spend time with a one-of-a-kind like Mac! Thanks Bruce! 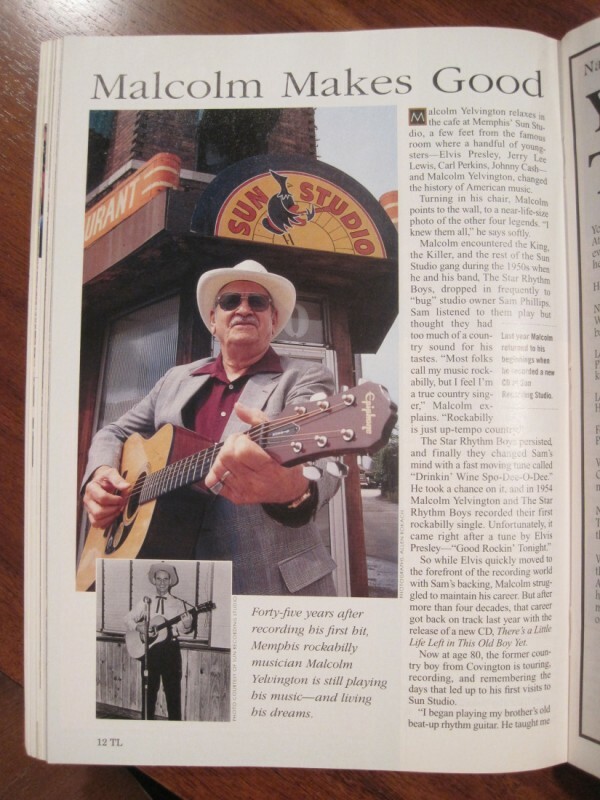 I have a copy of last train to Memphis… It is one of the paper books I will forever keep! Growing up in Memphis, I just thought it was music, but as I moved, I realized I grew up in a city of great music. Not everyone has the music experiences I have been able to enjoy! I knew about Malcolm back in the mid 50s when I first became interesting in everything Sam Phillips put out at Sun. Mac was the first white singer after Elvis put out his debut disc on Sun in 1954, to have the next Sun disc. I didn’t meet Mac till March, 1994, when he was giving tours at Sun Studio on Union. No one knew him on the tour but me. When he got into the studio talking about the greats, I stopped him saying, “And this guy is another great”. I told the people on the tour all about him. Mac was flabbergasted. He let me take over and finish the tour. Afterwards, we talked with him back in Taylors Restaurant and he was fascinating. A great man. A walking history of Sun Records. Wish he was still with us. Paul MacPhail, Canada. He LOVED doing tours down there! And I would go down to share a coke with him now & then on breaks…. He loved sharing his passion with others and I am sure he loved letting you do the same! Thanks so much for sharing your story, you made me smile as well as making me tear up. Thank you! Janice that was so cool. I love the music- this was my Friday night! Love your posts- don’t always have time to reply. Thank you for amazing adventures- I love following you. An awesome video and article. Thanks for sharing. Chuk sent a signed CD to me when Malcolm released “There’s a Little Life Yet in the Old Boy Yet,” signed to “Linda Jo,” of course. All those times hearing Malcolm sing at BH at Family Camp are some of the best memories I have. And, I wasn’t a life-time family camper. I think I went 18 years of so. I had no idea until later in my life that Mac was “who he was!” I just thought he was this cool, nice man who played and sang well…and it was so much fun to sit and listen and sing along. Loved his smile. Great memories and there was a song about butterbeans, wasn’t there? Did he teach us “Cabbage Head?” Okay, now you have the memory bank open! That was supposed to be “There’s a Little Life Left in this Old Boy Yet.” Got my words mixed up! A compliment from overseas, Holland, Europe. A very nice film about one of my old time favorites, Malcolm Yelvington. Although we’re snowed under by todays meaningless music, it’s good to see on this site that there are still so many people out there that like the times that music was played from the heart and with feeling, just like your ucle, and his buddies from then, did. Whenever I feel sad or depressed all I have to do is put on a cd with this kind of music. Better than seeing a doctor in my opinion. Thanks for the article and the film. Hello Janice, thanks for your reply on my mail. I know of an album issued by a Dutch company called “A Tennessee saturday night with Malcom Yelvington”. It’s a recording of a 1988 concert in Rotterdam by your uncle. The company is Collector Records, and the cd has number cl cd 4403. Maybe you could send them an e-mail and ask if it’s stll available. Won’t be hard to find the company on the net I guess. I went to a lot of concerts in the 1980’s, when I was in my twenties. A lot of American musicians came to play here in what was called the Rock and Roll revival. It were great times and I remember seeing artits like Jerry Lee Lewis, Carl Mann, Janis Martin and the likes. They were at age by then, but believe me, they realy gave younger musicians which also performed at these shows a run fortheir money. All happy memories. Thank you! I’m listening to the disc now! Amazingly they added it to i-Tunes recently, not sure I ever would have searched for it since I’d previously bought everything I could find on i-tunes! You have truly given me a great gift! THANK YOU and HAPPY HOLIDAYS! Hearing Uncle Mac talk between the songs warms my heart in so many ways! Thank you! I enjoyed reading what you had to say about my about my dad Malcolm Yelvington . I have recorded a couple of his songs and placed them on You Tube. They are not nearly as good as he did them , but I had fun recording them in my office at school on Garage Band. Thanks for you kind expression of caring about my dad. You’re welcome Skip! What’s your youtube channel address? Would be fun to check them out. I could see you Phil & Tony doing something like that back in the day! LOL! Type in Malcolm Yelvington Jr. on You Tube. Just had to say the first time I ever heard of Malcolm Yelvington was on a Charly lable in England singing Way Down Blues. What a voice as I was hunting around for Charlie Feathers who was on the same record. Whenever I’m down I play that song along with Delmore Brothers and Hank Williams to Gene Vincent. I could go on but Malcolm Yelvington is up there with the rest of the best! Thanks for sharing your memory…. Love knowing others are still enjoying his tunes!